Goodreads says, "The most tragic love story in history . . . Juliet Capulet didn't take her own life. 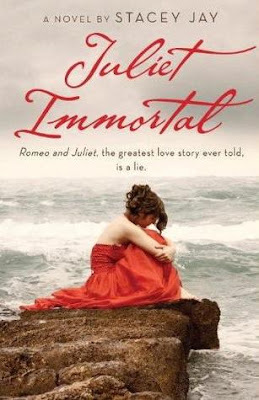 She was murdered by the person she trusted most, her new husband, Romeo Montague, a sacrifice made to ensure his own immortality. But what Romeo didn't anticipate was that Juliet would be granted eternity, as well, and would become an agent for the Ambassadors of Light. For 700 years, she's fought Romeo for the souls of true lovers, struggling to preserve romantic love and the lives of the innocent. Until the day she meets someone she's forbidden to love, and Romeo, oh Romeo, will do everything in his power to destroy that love." *You had me at Juliet. Any book dealing with one of my favorite Shakespearian plays, Romeo and Juliet, is a book for me. The synopsis sounds extremely unique; plus, who doesn't love that cover? Let me know what you think! I have this one on my TBR list too. Great pick! I do like the twist on the usual starcrossed love theme. I've been waiting on this one for what seems like forever and finally pub date is nearing. The cover is absolutely fantastic! I have this one on my list too! Can't wait for this one. The cover is gorgeous!! This was my pick a few weeks back, I can't wait either! I want this too!! It sounds soooo awesome!! CAN'T WAIT for this one! Between that cover and that synopsis, I have to have this one:) Awesome pick this week Christina! I can't wait to hear more about this one. Such a beautiful cover too. One of my top picks too! Sept isn't too far away! I soooooo cannot wait for this book! I really, really want to read it. :) Awesome pick! Ooh! That blurb alone makes me wish the book was out already so I could read it now! I'm a huge Shakespeare buff, too, and I love the premise of turning the "true" story of Romeo and Juliet on its head. Thanks so much for the rec! I'm waiting on this one too! The cover is gorgeous, and the take on the Shakesperean world sounds really original. Can't wait! Thanks for checking out my WoW everyone! I had no idea that they moved up the pub. date! Thanks for sharing that info.